The Terminal Station seemed destined for the similar fate of Union Station (parts of which were built before the Civil War) at the center of town, which was demolished in 1973. 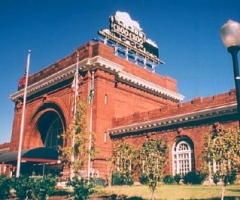 But Terminal Station was saved from the wrecking ball by a group of local businessmen who were inspired by the theme of the "Chattanooga Choo Choo." They invested $4 million before its new grand opening on April 11, 1973, and the beautiful Terminal Station once again opened its doors to welcome visitors to Chattanooga - this time as a unique vacation complex. With its listing on the National Register of Historic Places in 1974, the Chattanooga Choo Choo is considered one of the city's first historic preservation projects. In 1989, a group of Chattanooga investors, known as Choo Choo Partners, Ltd., brought new management and invested another $4 million+ dollars in renovations to the complex. The hotel was welcomed into the Holiday Inn family, assuring Choo Choo guests of superior, affordable accommodations. 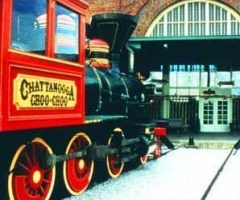 The Chattanooga Choo Choo, famous in history and song, is now a magnificently restored structure for all to enjoy. Today there is again the bustle that was so familiar in the railroad days. 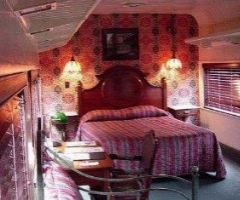 Sleep aboard an authentic train car! Traveling across the nation by private railroad car was the height of luxury in the early 1900's. The railroading excitement of a bygone era is still present onboard one of our 48 Victorian train cars at the Chattanooga Choo Choo complex. Where else can you overnight in a beautifully restored Victorian train car? Only the very rich could afford a private car in 1900, but today the train cars are tastefully decorated and available for many of our guests. Although you may be reminded of a past era while staying aboard our rail cars, you will have all of today's conveniences. All traincars offer DSL internet access. Due to the metal construction of the traincars, the wireless signal is unable to transmit. Each car includes a queen size bed, and some cars also have a daybed with a pull out trundle bed. The only thing missing from your night in a Victorian Train Car is the "clickety-clack" of the rails!